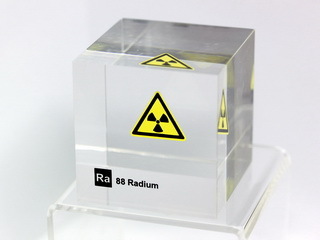 Radium is a radioactive chemical element which has the symbol Ra and atomic number 88. Its appearance is almost pure white, but it readily oxidizes on exposure to air, turning black. Radium is an alkaline earth metal that is found in trace amounts in uranium ores. It is extremely radioactive. Its most stable isotope, 226Ra, has a half-life of 1602 years and decays into radon gas.